Overstock Special!! Blue Courier Tote With Built-In Lid - Only 4 Left, Free Ground Shipping!!! Overstock Special!! Blue Courier Tote With Built-In Lid - Only 2 Left, Free Ground Shipping!!! Overstock Special!! Blue Courier Tote With Built-In Lid, Free Ground Shipping!!! Hurry before they are gone ... Only 2 Left. Manage bulk mail with our full line of courier totes. Courier totes are indispensable tools in today's busy mail room, mail center, office and warehouse. They handle everything from bulk mail, parcel sorting to presort and zip-select bundling for large outbound mailings. 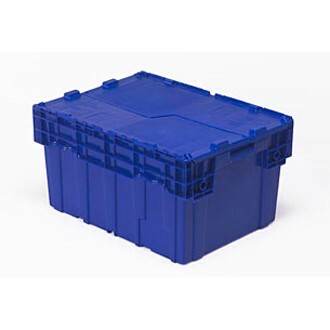 Also perfect for moving parts, supplies and equipment; holding excess inventory and storing records and files. It won't be long before you wonder how you got along without them! Hinged lid is attached and can be secured when closed with a simple cable tie (Part number 1000). Stack when closed and nest when open. Available only in Blue. Keep lid secure with our plastic cable fasteners - click on Part Number 1000. • 2-piece hinged top that interlocks for security. • Made from molded plastic with strengthening ribs and easy-grip handles. • Available in Blue only. This is a close-out special - No returns.